Several weeks ago, I took my car to the shop for some much-needed repairs. I knew it would be a lengthy wait, so I took along some reading material to keep me occupied. Shortly after I arrived, I noticed a young woman who appeared to be very upset. My first thought was to mind my own business, but it was obvious she needed someone to show her that they cared. That someone was me. She answered, “No,” then continued to tell me that she had suffered from severe anxiety attacks all her life. Through the years she learned to cope with the attacks, but this one was shaping into a monster. She asked me to stay with her until the attack passed. So, for the next few minutes we talked about weather, family pets, and coping techniques for anxiety. About ten minutes later her anxiety attack began to subside. Her rapid heartbeat settled down. Her hands stopped shaking, and her breathing returned to normal. We talked for a few more minutes, then she thanked me for my time and departed to see if her car was ready. In our conversation, the woman described her anxiety as waves washing over her. God understands her struggle, and I love the power of peace He displays in verse 7… “It’s wonderful what happens when Christ displaces worry at the center of your life. Summing it all up, friends, I’d say you’ll do best by filling your minds and meditating on things true, noble, reputable, authentic, compelling, gracious—the best, not the worst; the beautiful, not the ugly; things to praise, not things to curse. Put into practice what you learned from me, what you heard and saw and realized. Do that, and God, who makes everything work together, will work you into his most excellent harmonies (4:8-9). Yes… this sums it up. Let petitions and praise shape our worries into prayer! Jesus takes the place of our worry, and God works us into his most excellent harmonies. 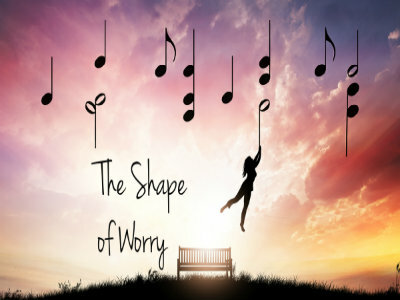 I love this word picture…God shapes worry into a symphony of peace! Remember this… you are loved, and you are always in my prayers.